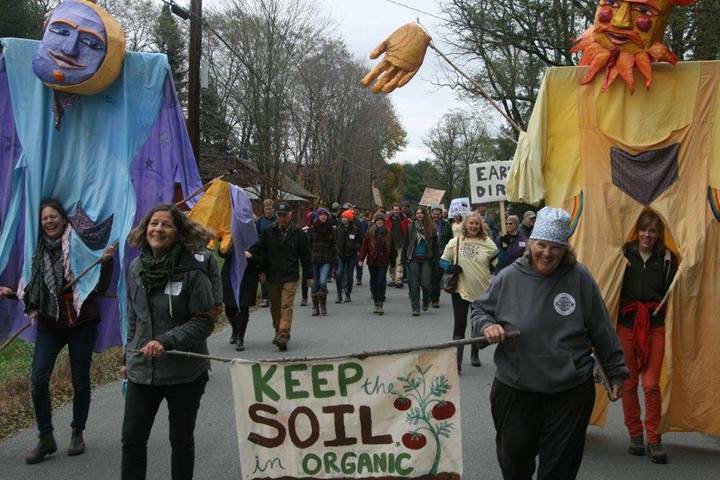 The first of two rallies to keep the soil in organic takes place this Sunday October 8th at the Intervale Center (180 Intervale Rd) in Burlington VT. The second rally is being planned for Sunday, October 15th on the green at Dartmouth College in Hanover, New Hampshire. These are just two of dozens of rallies happening around the country this fall in solidarity with organic producers growing in, and caring for the soil. Tractor parades at each rally will start rolling at noon, followed by brief speeches, local food, live music, and lively celebrations! Speakers at the Intervalle rally include: Senator Bernie Sanders, Eliot Coleman, Lt. Governor David Zuckerman, Maddie Monty, Christa Alexander, Taylor Hutchison, Will Raap, Joe Tisbert and Pete Johnson. Please join us as we rally together to take back the National Organic Program (NOP) from corporate influence and reclaim the lost meaning of organic. Organic integrity has suffered in recent years as a flood of hydroponic vegetables and berries and products from animal confinement operations have forced their way into the Program. Join us in sending a strong message to the National Organic Standards Board (NOSB) that animal confinement and hydroponic production have no place in organic. Real organic is based on healthy soil and working with natural systems, not imitating and replacing them. We are preparing for a historic NOSB vote in November on reconfirming fertile soil as the foundation of organic farming. To keep up to date on the “Keep the Soil in Organic” movement, click HERE.